Integrity Arts is a teaching school. What specifically does that mean? It means that every single person in our community of students is accountable to the knowledge, wisdom, and the value of our practice. And this accountability is demonstrated in the stewardship that we each embrace as we share this wisdom with our fellow students. When Sensei is asked the question, ‘Sensei, when will I know that I’m ready to test for my next level’? 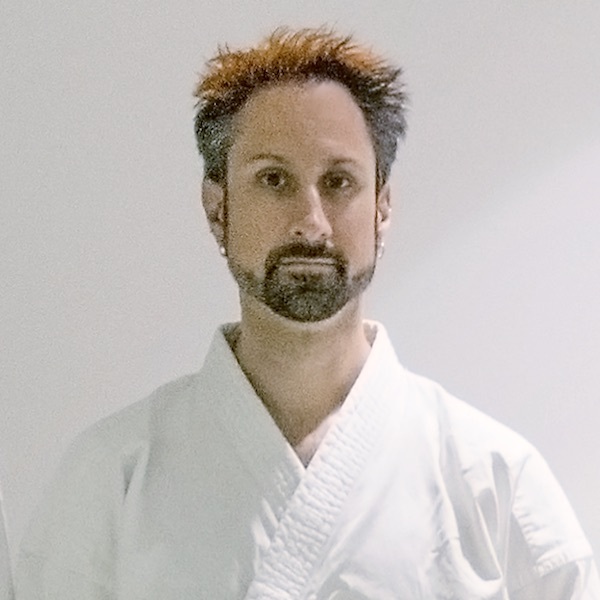 Sensei’s answer is always includes one critical criteria, ‘when you can teach your technique, at a proficiency for your level’. We honour and respect all those who have journeyed before us and who have taken the time and gifted us with their knowledge, wisdom, and the experiential learning that affords us the ability to share with others. Greg is a consummate student of martial arts, business and human performance, and is passionate about leadership. He holds black belt rankings in Aikido and Okinawan Karate, an MBA from Royal Roads University. On the Mats: with over 20 years’ experience as a student and instructor, Greg is co-founder and chief instructor at Integrity Arts, where leadership is learned through specific martial practice, that results in a capacity for martial leadership. And where the instruction is focused on training and techniques that are simple, practical and effective, promoting the discipline that develops self-awareness, self-control, and self-leadership; and the ability to influence and enrol others to become their very best by leading by example. Many wonderfully talented teachers and students from around the world have influenced Greg’s martial arts experience; and although the list of instructors who’ve had a positive influence on Greg on too numerous to list here, they all continue to inspire and fuel the passion to study, grow and teach. Off the Mats: Greg is a senior executive and entrepreneur whose work has spanned a wide range of industries including consumer packaged goods, healthcare, adventure tourism, construction, education and martial arts. Greg has worked his way through the organizational ranks from casual part-time work, to management and executive responsibilities including CEO and COO. Passionate about performance improvement and creating and executing successful business strategies, Greg understands human performance, teamwork, and team dynamics. His purpose is to serve, inspire and empower others. Greg currently serves as the Performance Strategist at Where The Head Goes…Performance Systems a business services company focused on business performance and business culture, where he provides 1-on-1 executive coaching, team performance coaching and business consulting. Greg is also the developer/co-founder of Mind Body Leadership training programs. MBL develops adults and youth into masterful leaders through training that enables the transformative leap from surviving and coping to leading and influencing. MBL is delivered through the Gustafson School of Business at the University of Victoria, as part of the NW-ACE Program, where Greg and his colleagues have been recognized and awarded nationally and internationally for significant collaboration in student learning and teaching, celebrating outstanding and effective business, education and community organization partnerships. MBL is also delivered to organizations, community and youth groups to develop physical, intellectual and emotional intelligence-based outcomes. Colleen is dedicated to providing guidance and support to develop the very best from everyone in her community. A master at pointing out the obvious, and able to provide wisdom and knowledge with humour and humility. On the Mats: Colleen has been practicing Okinawan Karate for over a decade now, including Kubudo weapons practice. 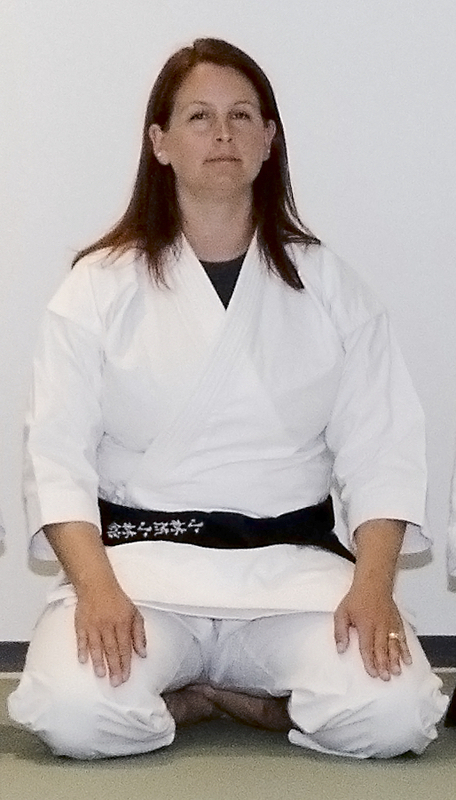 Colleen has her black belt in Shorin Ryu Karate and is dedicated to further honing her techniques, and mentoring and teaching her fellow students. Colleen is a founding member of Integrity Arts and is proud to be a member of this unique school. 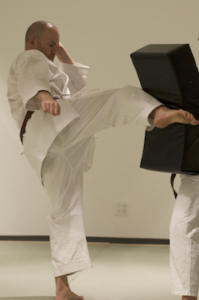 Colleen strives to be an example for other women who enroll in our martial practices. Off the Mats: Colleen is a professional early childhood educator and has been running her own pre-school and daycare center since 2002. Colleen has her diploma in Early Childhood Care and Education specializing in infant and toddlers. She is currently studying the SCERTS model for teaching children with autism and special needs. Colleen loves travel, hiking and spending time in the great outdoors with friends. She also enjoys cooking and baking in her spare time. Colleen has been known to share her especially creative baked cookies with fellow students on special occasions when they’ve earned the acknowledgment for their hard work. Bo Li is a student of martial arts and a community-oriented entrepreneur. Traditional martial arts have always been a passion for Bo (thanks to the many Kung Fu movies). He started his martial arts training in Wing Chun in his early 20s in Nanaimo where he also received his diploma in Recreation and Tourism Management at VIU. On the Mats: Bo Li is a black belt practicing Shorin Ryu Karate under Sensei Greg Martin since 2012. As a proud founding member of Integrity Arts, Bo leads by example by performing precision kata and technique. He also loves to provide his knowledge on self-defense drills and teaching close range strategies. Off the Mats: Bo is an entrepreneur who has run his own small business since 2014. Previous to becoming a business owner, Bo has 5 years of management experience in the adventure tourism industry, and also worked as a Bungee Jumpmaster and Zip Line expert. Bo loves outdoor activities, traveling and playing sports with friends. He plays basketball and volleyball in recreation leagues in Victoria. And Bo is also an amateur photographer who takes his DSLR camera everywhere. James is a nerd, both professionally and when it comes to martial arts. He is an avid consumer of articles and videos on improving martial practice and learning the history of Okinawan karate and other arts, which he both collects and shares with his fellow students. 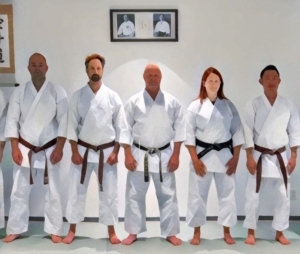 On the Mats: James is a black belt training in Shorin Ryu karate since mid-2012 and, while he has improved massively over that time, he still feels like a beginner more often than not. He is driven by a desire to understand the hidden meaning and learn practical applications of theory. The ongoing requirement for diligent and mindful practice keeps him both focused and (reluctantly) humble while engaging in teaching serves to remind him of what he has actually learned over his years of practice. Off the Mats: James is a software developer with a broad history of working with different technologies to create solutions for a wide number of industries. His passion lies in working with people and technology to solve interesting problems. Jon is our resident fitness subject matter expert, who provides his wealth of knowledge of health, flexibility, and the proper mechanics of martial punching and kicking techniques. A dedicated, disciplined, and a loyal student, executive, husband and father, Jon serves as an excellent role model. 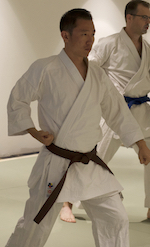 On the Mats: Jon is a black belt practicing Okinawan Karate since 2012. Coming from a background of coaching, Jon particularly enjoys working with students of all levels to enhance their skills and his own in the process. Jon’s first introduction to martial arts was as a student of Muay Thai that he practiced from 2008 to 2010 before being sidelined by knee surgery. Jon currently draws from his experience and training to design the warmup and post class stretch components of Integrity Art’s adult classes. Off the Mats: Jon is a construction manager/project manager, specializing in commercial construction. Jon has a Bachelor’s degree in Kinesiology from the University of Victoria, in addition to a level 3 Coaching Certification and a Graduate Certificate in Project Management from Royal Roads. As an avid proponent of health, wellness, and fitness, Jon participates in regular in group physical training sessions. He has a wife who is an athletic therapist specializing in concussion identification and treatment, and two sons, 4-year-old son and a new addition to the family who happily occupies the majority of his time. Aside from work and karate and when time permits – fishing, snowboarding, soccer, baseball, golf, and poker have been known to find their way into his schedule.